Jade Helm’s Bible, scripture and verse. Warning: The following may contain images and messages which are troublesome to those who suffer from cognitive dissonance and corporate media group think. 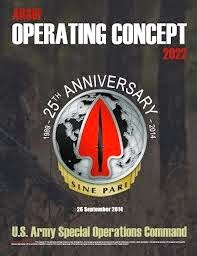 A relatively new and obscure document, U.S. Army Special Operations Command “ARSOF Operating Concept” is the blueprint for Jade Helm. This document does not boldly use phrases such as “extracting political dissidents”, but it does use “legal language” to basically communicate the same messages that many in the Independent Media have been telling the public about for 6 weeks, namely, that ARSOF is going to be used to extract political dissidents and then enforce martial law. Key phrases and terms of the ARSOF document are presented here so as to have no misunderstanding as to meaning and intent. Other relevant military documents are mentioned in order to reinforce the interpretation of the ARSOF, Jade Helm inspired document.